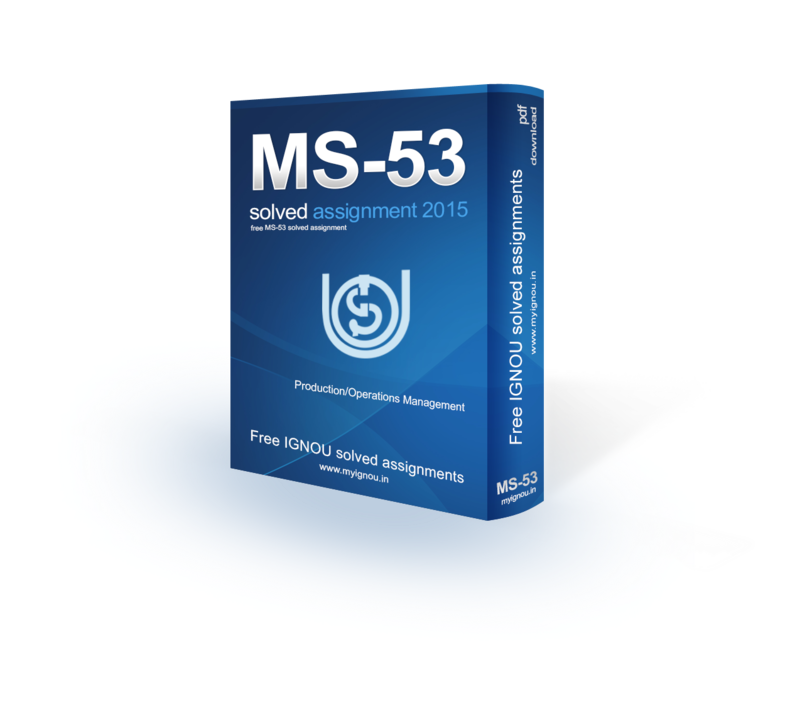 Welcome to IGNOU MS-53 Solved Assignment 2015 download section of myignou.in. Here you will be able to download IGNOU MS-53 (Production/Operations Management) Solved Assignment for (January - June) 2015 session for free exclusively on this website. To get other solved assignments like our facebook page. Note: Attempt all the questions and submit this assignment on or before 30th April, 2015 to the coordinator of your study center. Q1. What is the system view of operations Management? Identify the input, process and output for the following production systems. A System is a group of interrelated items in which no item studied in isolation will act in the same way as it would in the system.A system is divided into a series of parts or subsystems, and any system is a part of a larger system.The system’s boundary defines what is inside the system and what is outside.A system’s environment is everything outside the system boundary that may have an impact on the behaviour of the system.A system’s inputs are the physical objects of information that enter it from the environment and its outputs are the same which leave it for the environment. The activities in an operations system can be classified as inputs, transformation process and output. Inputs are classified into three general categories-external, market and primary resources. Transformation resources are the elements that act on, or carry out, the transformation process on other elements. These include such elements as labour, equipment/plant and energy. The nature and mix of these resources will differ between operations. The transformed resources are the elements which give the operations system its purpose and goal. The operations system is concerned with converting the transformed resources from inputs into outputs in the form of goods and services. There are three main types of transformed resource of materials which can be transformed either physically(e.g. manufacturing),by location (e.g. transportation),by ownership(e.g.retail) or by storage(e.g.Warehousing) or other private services, Government services. Download the full assignment from the download button above. Share "IGNOU MS-53 Solved Assignment 2015"
Share this page (IGNOU MS-53 Solved Assignment 2015) to let others know about it!